We may believe we know celebrities from the familiarity of their video appearances. But the persona we may get used to seeing is not necessarily the real, nor whole person. Some now see candidate Donald Trump’s public behavior and are quite concerned. Is he merely the benign if very outspoken rogue, as so often depicted by grinning pundits? A known quantity? I suggest no easy dismissal of caution after sharing observations with Sam Vaknin. 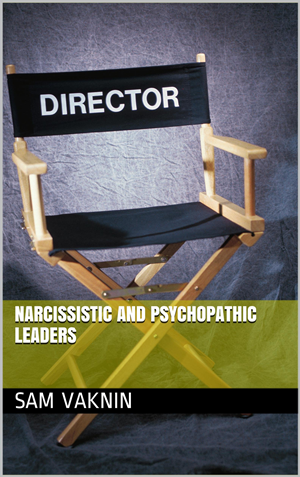 Shmuel “Sam” Vaknin, Ph.D. is an authority on the subject of narcissism, having written the widely read and very favorably reviewed book, Malignant Self Love: Narcissism Revisited, also Narcissistic and Psychopathic Leaders. His work is cited in dozens of scholarly, peer-reviewed articles. He may be described as a polymath, with extraordinary expertise (and experience) in abnormal psychology, and with focuses including temporal physics (his Ph.D.) and politics (see his Web site and YouTube site).